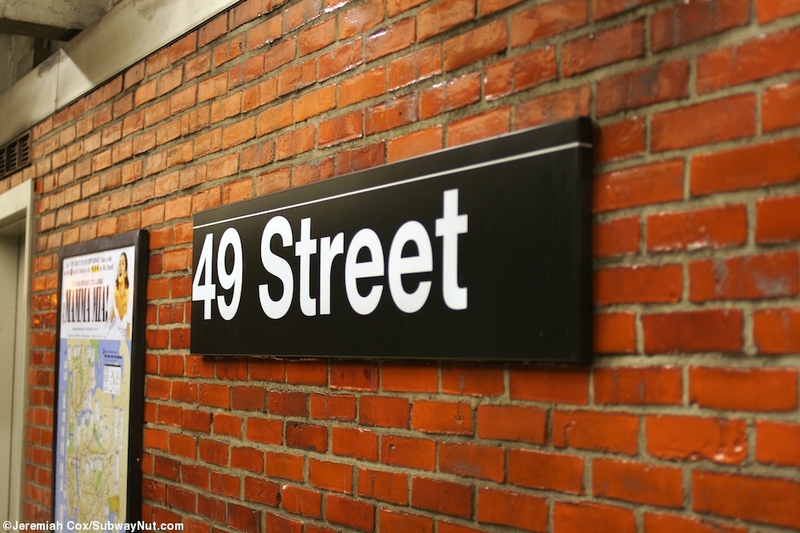 49 Street is a stop on the BMT Broadway line that is in the layout of a local stop with two side platforms for the four track line with no free change of direction transfer, but is served by all trains running to Queens including those making express stops farther south. 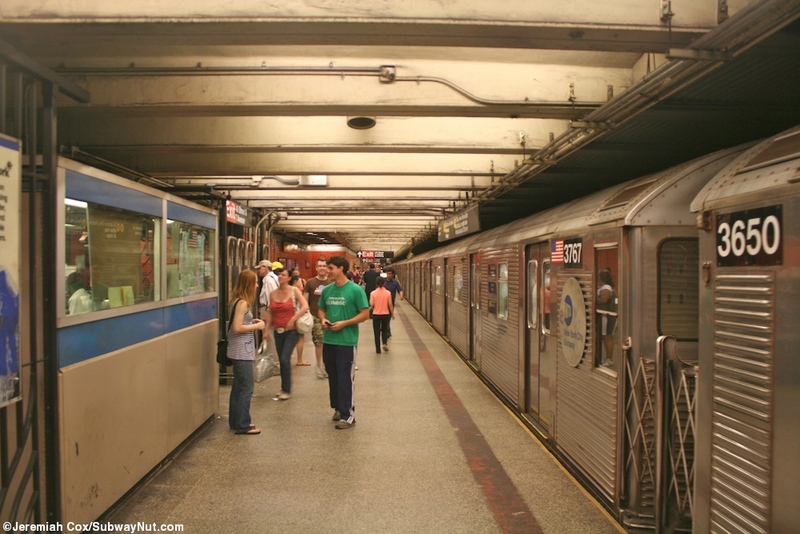 The stop is heavily used enough that these trains crossover between 34 Street and 42 Street. 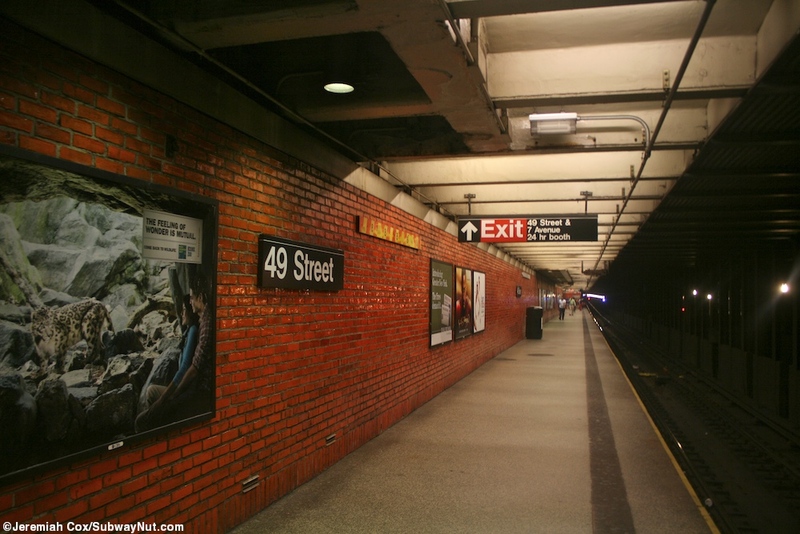 This means that today all trains stop in the station except Q trains during nights and weekends when they terminate at 57 Street and are not extended to Queens. 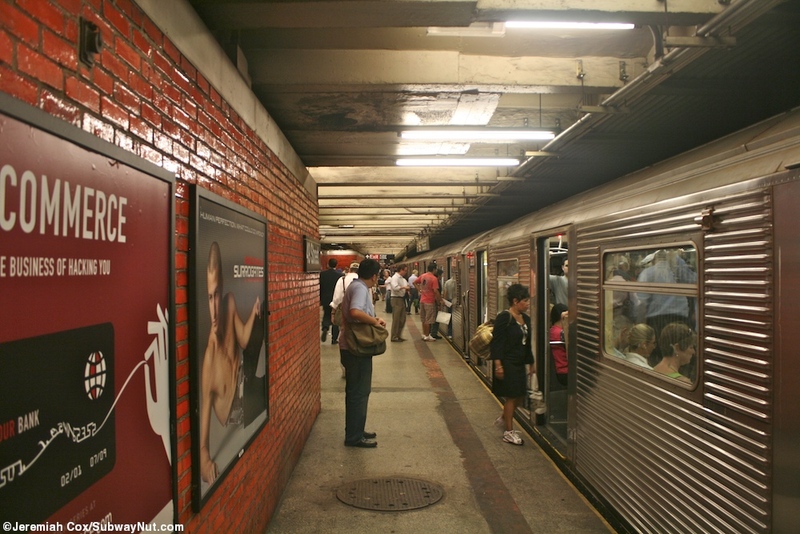 The stop was modernized in the 1970s with orange brick walls and supposedly sound proofing that did not due a whole lot. 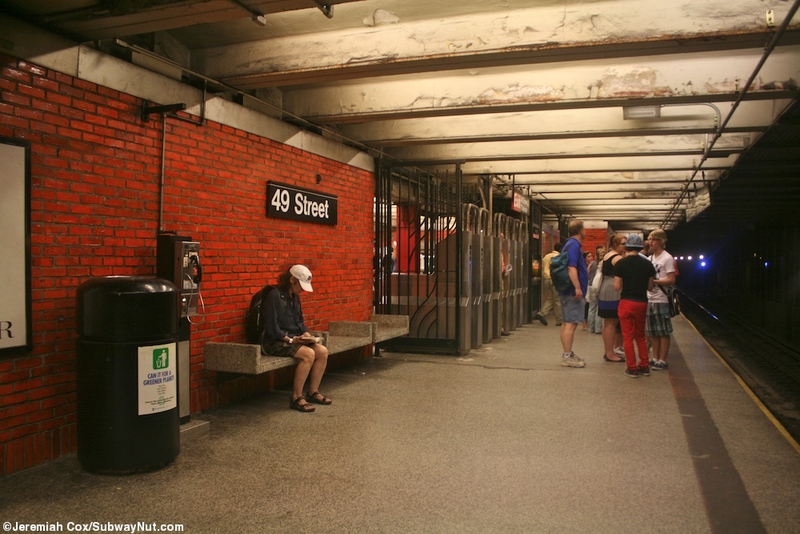 There are also unique bucket style concrete benches along these platform walls, and the ceiling has concrete lights and light fixtures along it. 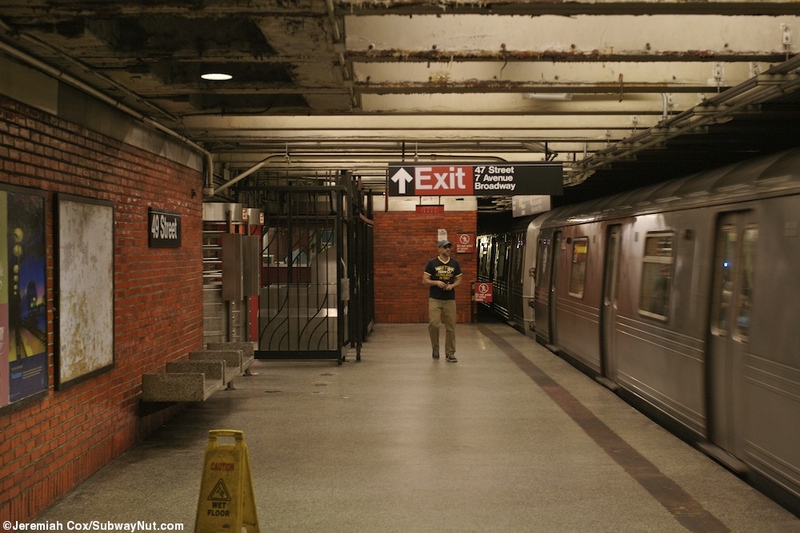 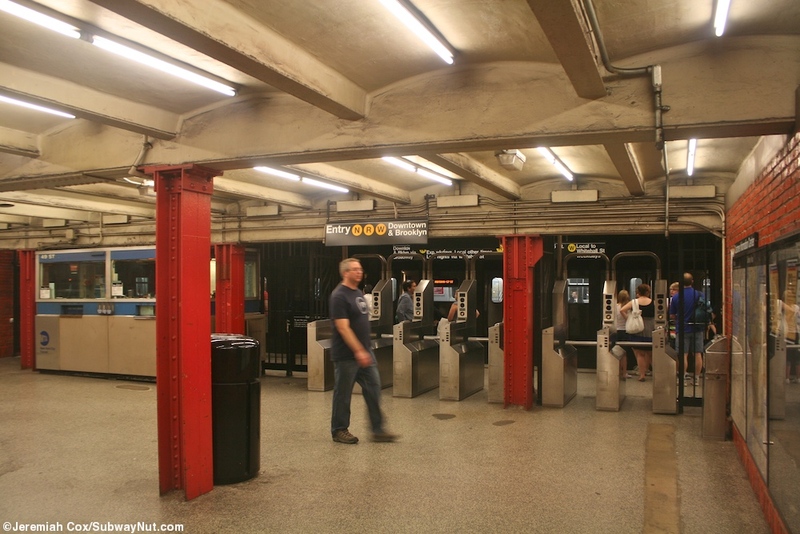 For exits each platform has two, a northern one at 49 Street and a southern one at 47 Street, all fare control areas are directly along the tracks with both turnstiles low and high except at the 49 Street exit on the downtown platform where the 24 hour token booth is. 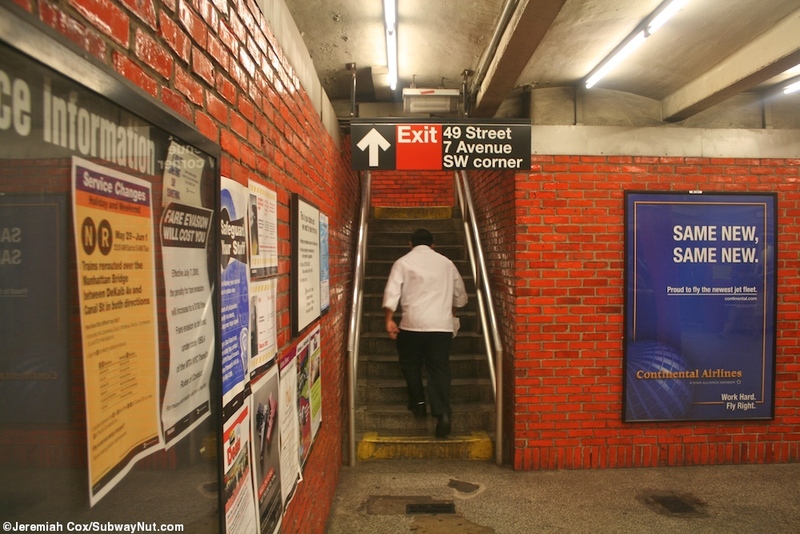 This exit leads up to an unusual street stair with orange bricks like the station at the SW of 49 Street and 7 Avenue. 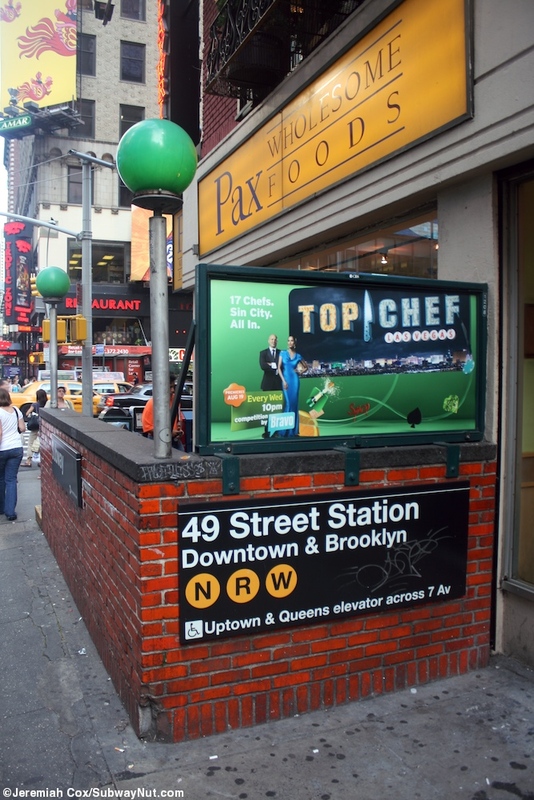 Up the NW corner right on the corner inside a building. 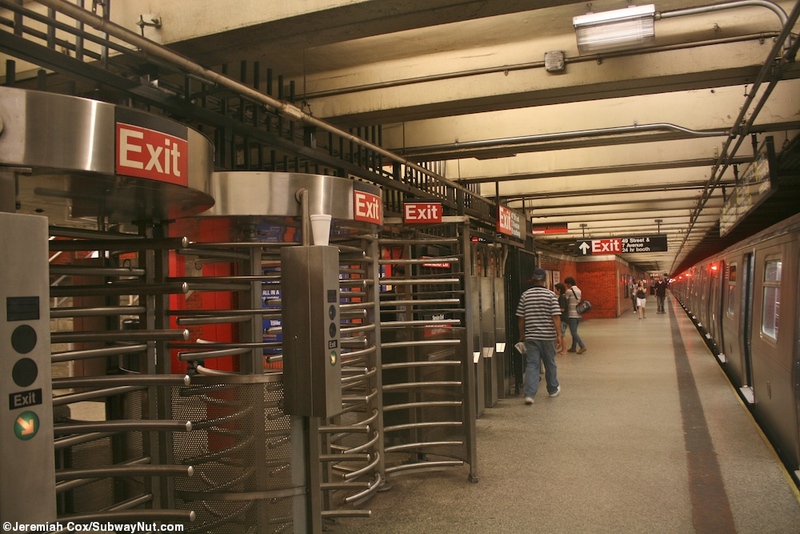 On the Uptown side here up to the NE corner is inside a modern extension building of Rockefeller Center, there is an elevator that makes the uptown platform ADA compliant, and also stops at an intermediate landing with doors to the Rockefeller Center Concourse. 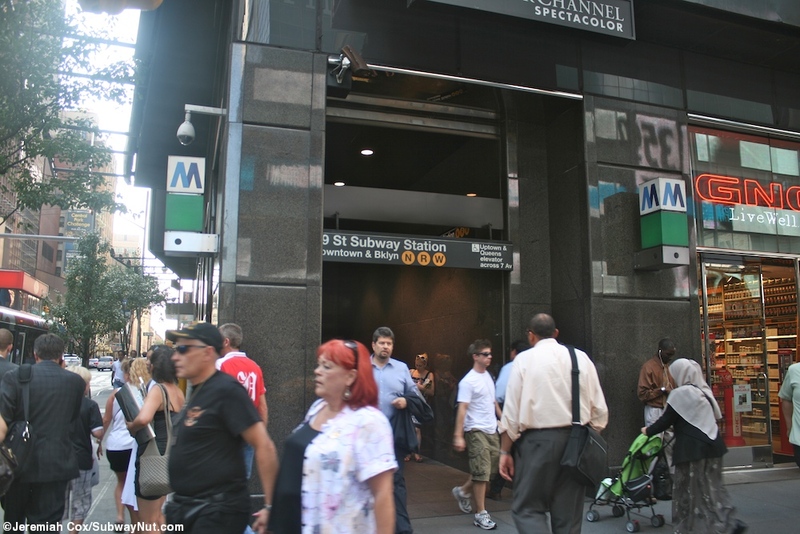 This elevator has a unique designed and is not maintained by the MTA but Rock Center. 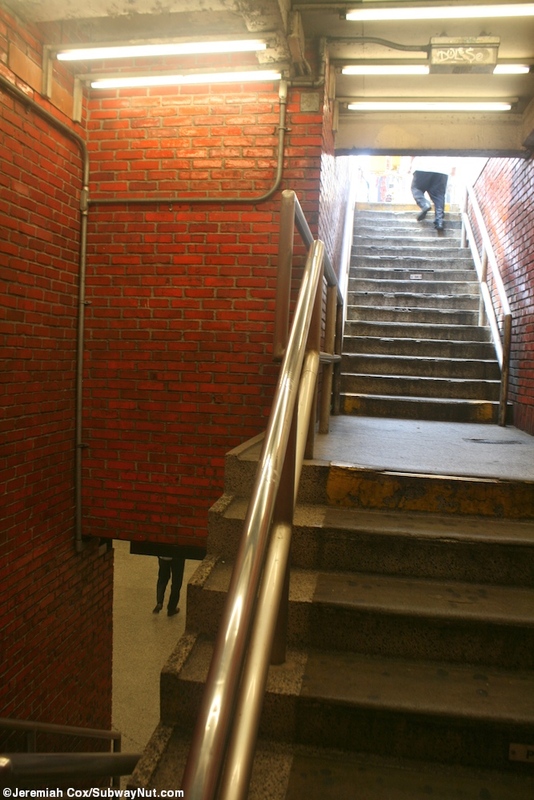 At the SE corner is a conventional green streetstair. 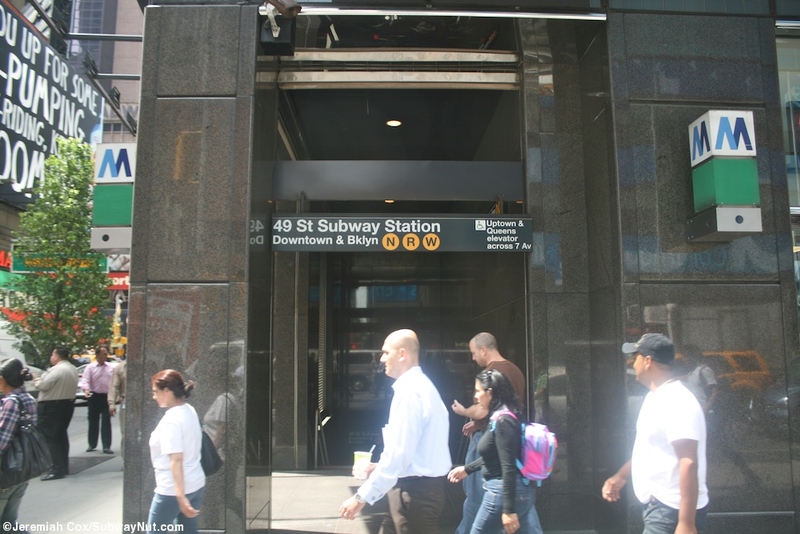 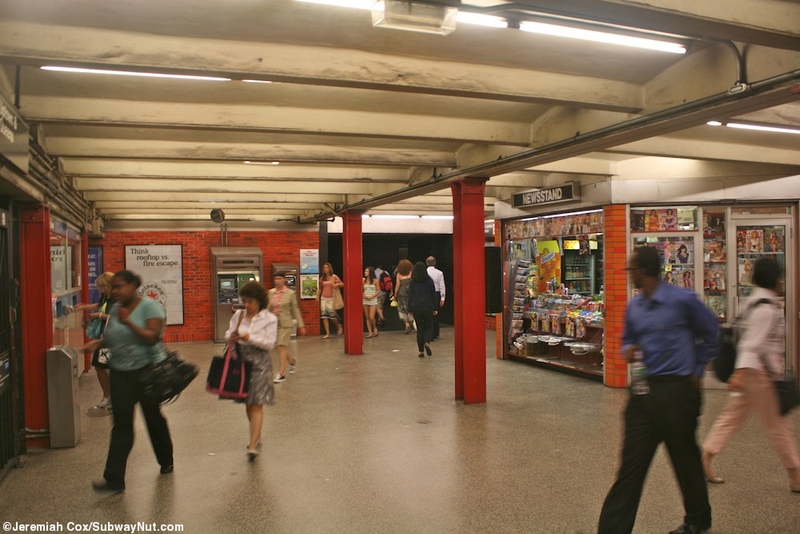 At the 47 Street end of the station, right across from the Tkts booth, for the uptown side of the station there is a single entrance staircase inside a building beneath lots of billboards on the SE corner of 47 Street and 7 Avenue. 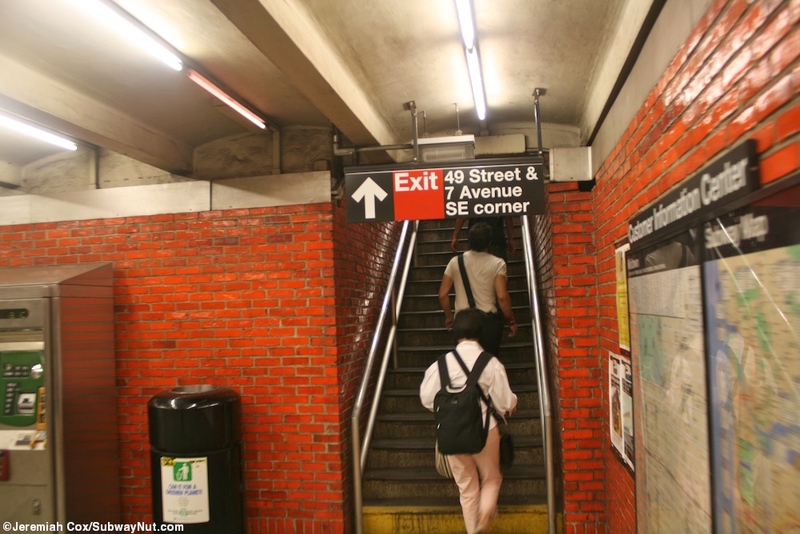 On the downtown side there are two street stairs: one is a street stair on the NW corner of 47 Street and 7 Avenue and the NE corner of 47 Street and Broadway, since just a block south Broadway and 7 Avenue cross each other and the IRT and BMT switch lines. 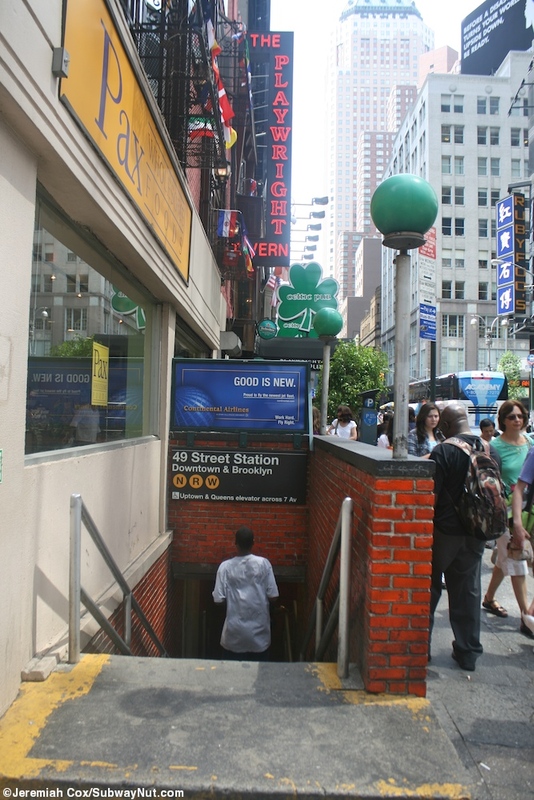 Both of these streetstairs have glass on eitherside of an Olive Garden.